Hardcover: Alfred A. Knopf, 2013. A cultural examination of paper and papermaking over the past two thousand years, On Paper succeeds Dard Hunter's classic work, Papermaking: The History & Technique of an Ancient Craft, first published in 1943, also by Alfred A. Knopf, and still in print. 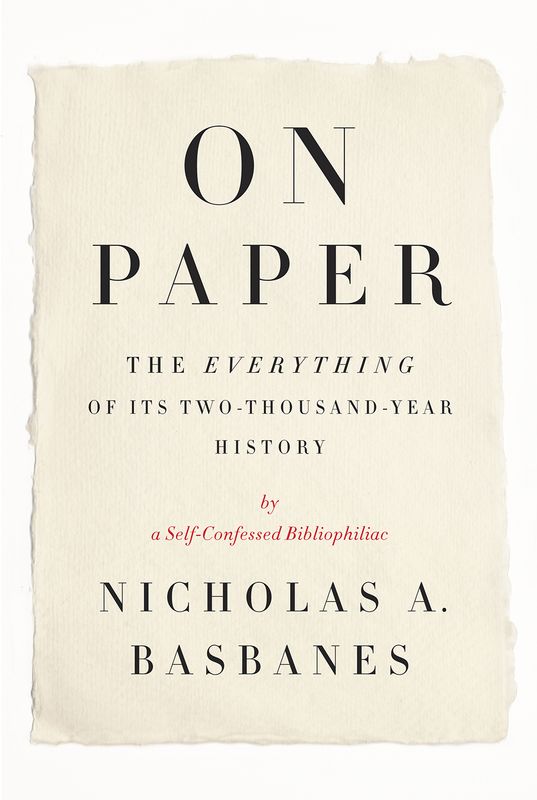 Nicholas Basbanes, author of A Gentle Madness (a National Book Critics Circle Award finalist) takes readers on a tour of paper's history while exploring its many uses in a striking variety of ways. He visits ancient papermaking sites in China and Japan where paper is made by hand in much the same way as it was when first invented. Selective visits to modern paper mills illustrate the various uses of paper today, each presented within a historical context, with currency and toilet paper-quite literally going from one extreme to the other-among them. It also features visits to various document and manuscript archives, and interviews with a master forger for the CIA now the subject of a major motion picture (Argo) and a Living National Treasure papermaker in Japan. Other chapters include profiles of master origami folders and textual scholars at work on the papers of such seminal figures as Leonardo da Vinci and Ludwig van Beethoven. It is no wonder that the Chinese regard paper as one of their four great inventions of antiquity: it has played a fascinating role in human progress and remains essential to daily life despite predictions of a paperless future. "Nicholas Basbanes’s On Paper is an exhaustive but engaging survey of the history of a beautiful human artefact." — Philip Marchand, National Post (Canada) "Favourite Books of 2013"